Right off the bat, WR is one of those much more welcome multiple restaurant chains on the BBQ scene. Why? Simply because they do their meats right. And none of the sides seem to disappoint either. 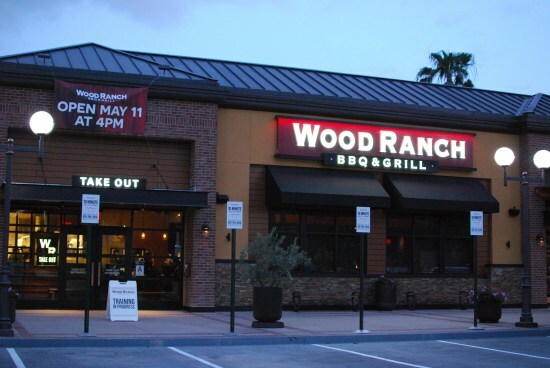 I was a fan of their second location (17 and growing, all but one in CA) in Agoura Hills in the 90’s when I lived in the San Fernando Valley and then was quite pleased when they opened in Northridge which was only a few blocks from my home. But I left the Valley for San Diego seven years ago and had not been to their Mission Valley location until now. By the way, ALL their locations are beautifully designed. Dare I say sophisticated? It’s BBQ, so pretend I didn’t. While it may seem I like a LOT of the places I’ve been to is because, I’m a BBQ lover. Can BBQ be done wrong? Well, sure it can. You’ll find a couple of those duds right on my site. I do try to find some good if I can even when I’m not thrilled with a place, but what you get, is my honest opinion. And honestly, I truly enjoy WR. Be warned that the food in these pictures aren’t necessarily served the same way that you’ll be getting them, so we’re talking plating here. I sampled a LOT of dishes to be able to give you a full picture of what they serve. Mind you, I didn’t even get to their burgers, steaks or salads. But a salad is not what I think of anyway when I’ve got my Que feed bag on. I didn’t get a picture, but their gaucamole was excellent. And I make a guac that is requested by everyone I know when a party is coming up. So, get this as an appetizer with some really good tortilla chips to start your meal off with. This might get you fuller faster, but you won’t be sorry! Unlike a very popular and growing chain here in San Diego, namely, Phil’s BBQ, this place DOES smoke their meats. The only similarity was the long wait at their Northridge location like the lines at Phil’s. Not enough people know about them yet here in SD to deal with that……yet. But like any BBQ place worth their weight, they’re smoking their meats and seafood (!). And WR utilizes 4 woods in their system. 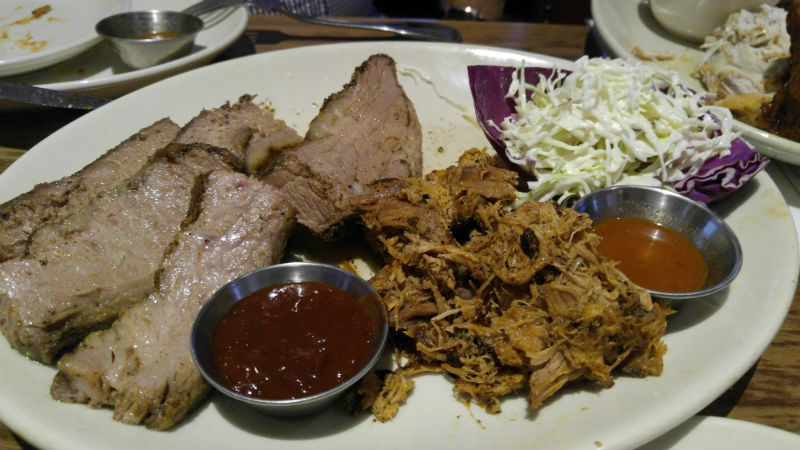 They first smoke their BBQ meats and then grill them over mesquite to finish them off. They smoke them as such…. That speaks of a place that truly cares about how their meats taste. Usually, tri tip is served Santa Maria style, with an open flame on a grate system that gets lowered and raised as the meat is cooked to medium or above . Here it is imparted with a slightly smoky mesquite flavor that is just fantastic AND it’s served steak style with a saucy glaze. Not sliced, but a big ole hunk o’ meat. It was tender and delicious but this is not usually my favorite cut of meat. It is here though. In fact, it’s what I would order again when I go back. And I will be back. 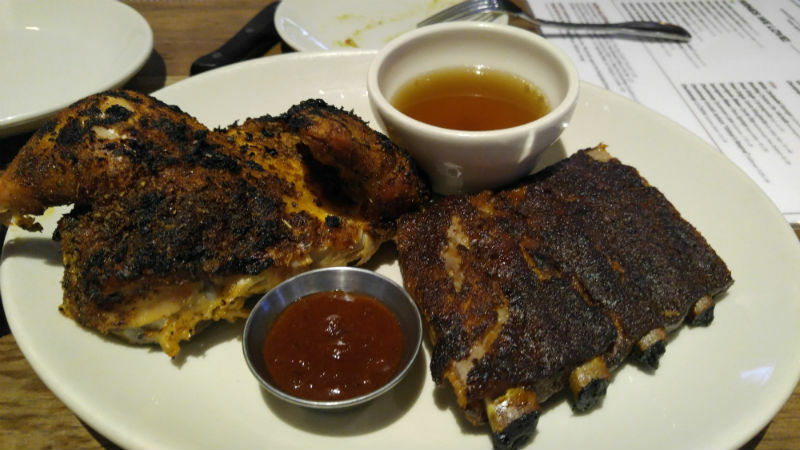 Their St. Louis style pork ribs are also meaty, tender and just about to fall off the bone. I really enjoyed the dry rub they use. I’m not a big fan of their baby backs, as the meat is more sparse here then I’m accustomed to for this cut, but they actually look as long boned as their St. Louis style. 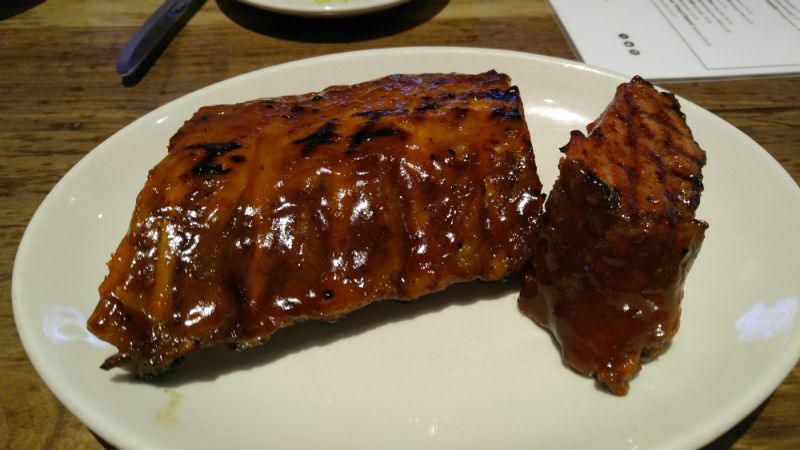 I was actually surprised when they told me it was their baby backs when they first set them on the table, but once I cut into them, it was obvious by the lack of meat on them. Truly, both were so tender and mouth watering, but I’d just go with the St. Louis style for the more meat factor. Seems there is a similar dry rub, plus or minus a few herbs and spices from their St. Louis style ribs, used on their chicken, which was also very tender and tasty. 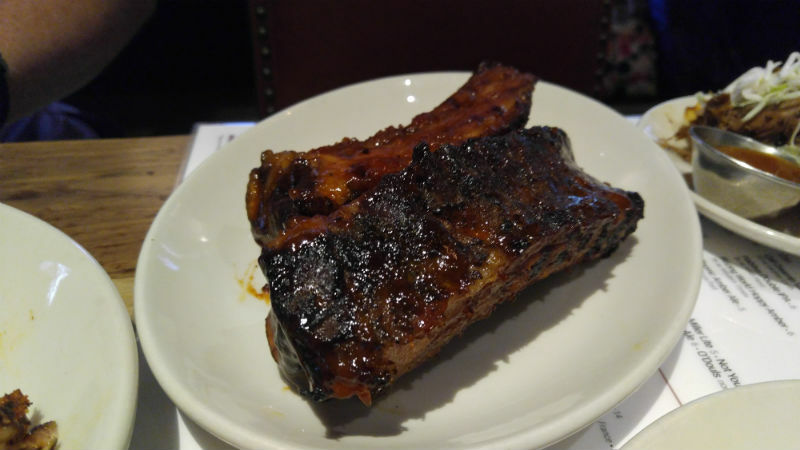 Their beef ribs on the other hand were meaty, beefy, big and bouncy! Truly smoked until they are so tender that you’ll have to look twice to make sure they’re beef. Too many times we have had beef ribs that you’d swear you’re fighting with that cow to get them off the damn bone into your mouth! Not here. They do serve a decent brisket here, but it was a bit fatty for me. While I know fat imparts flavor, this was a bit too much for my taste. Maybe it won’t be for yours. In fact, I would rather see it sliced much thinner, then the fat would render a bit more and still maintain that flavor and tenderness. Moist as it was, I attribute that to the fat factor. WR does make their own BBQ sauce and it is on most of the previously mentioned proteins. I like when sauce is baked onto the protein or they throw the meat back into the smoker a bit to get that candied glaze going which they seem to pay attention to doing here. I’m just not thrilled that they use high fructose corn syrup in their sauce as it makes it a bit gloppy and too sweet for me. On the other hand, their pulled pork (hormone and anti-biotic free) sandwich and some other entrees are served with a sauce they’ve concoted that really packed some heat and sweet, their Chipolte Cherry sauce. Wow, I really liked that and would use that for any dipping sauce or on any of their sandwiches. They also make a thinner, Carolina sauce that is a bit more vinegary for those that like that. The pulled pork was also another successful protein here. Not mushy, but cooked just right. Any of the sauces would work on it but don’t pass up that Cherry Chipotle on this sando. Smack you good it will! 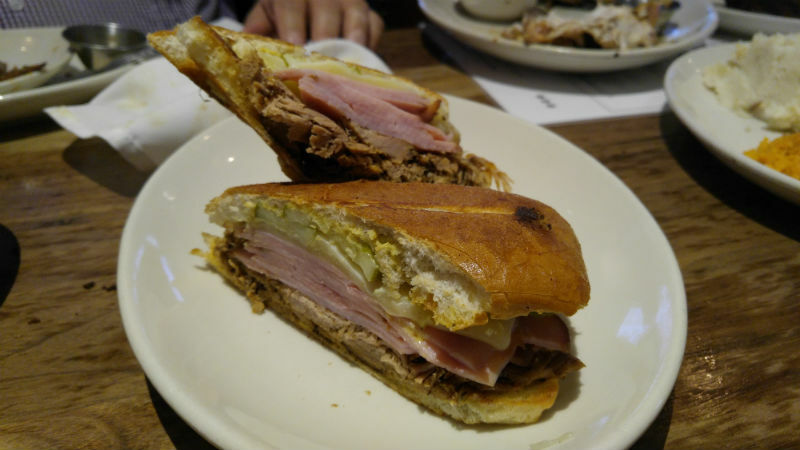 One dish that surprised me was the cleverly named Bar-B-Cubano sandwich. Pulled pork, honey-smoked ham, swiss, pickles with Dijon pressed into a baguette, it was a surprisingly good take on the traditional Cubano which I think any fan of this sando would enjoy. I sure did. Onto their mostly excellent side dishes. I’m always harping on the lack of attention paid to sides at a lot of BBQ places as they place most of their focus on their meats. 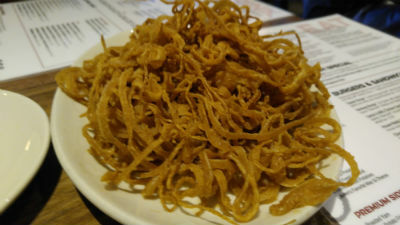 But great sides can literally make you want to go back to THAT place and their shredded onions are one of those dishes. So crunchy and NOT oily, that’s a big plus in my book. They taste so scrumptious dipped in their sauces too. Other chains feature this yummy side, but WR has perfected it. Eat them up, because they don’t necessarily reheat very well. Being a recent fan of cole slaw, I’m really digging the WR version. Those peanuts take it to the next level and it’s a bit sweet without overpowering the sauces on your meats. 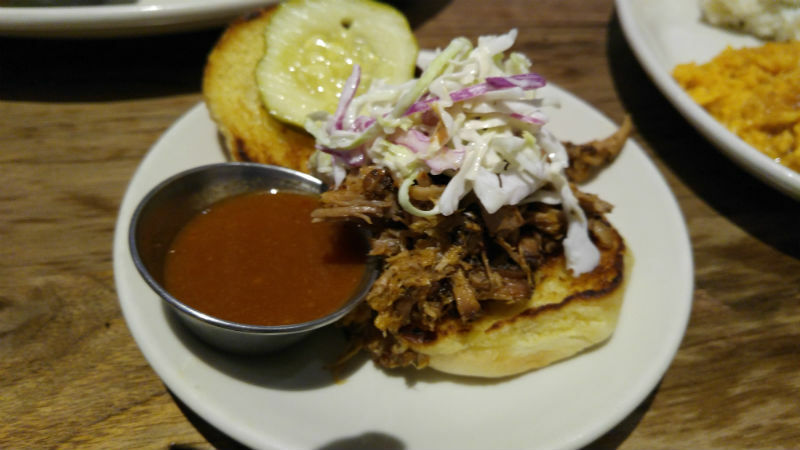 It’s a perfect compliment to their pulled pork sando, but I kept going back to it throughout my meal. All you potato lovers out there will be pleased to see they make them mashed, baked, fried, stuffed and they even have sweet potatoes, one of my favorites. Not a big fan of their mashed yams….unless they have melted marshmallows on them, but that’s for another time! I like them whole with a bit of butter on them. 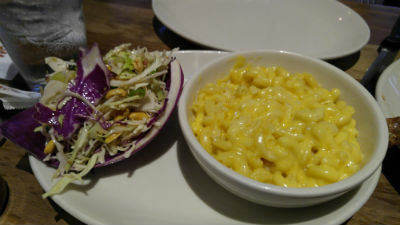 Another mac ‘n cheese that was pretty decent too. How did I have room for any dessert I’ll never know. 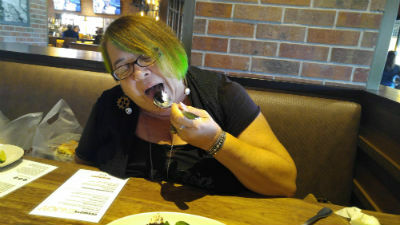 Oh yeah, it was DESSERT!! 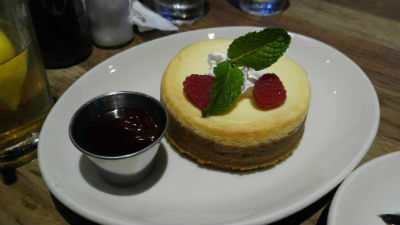 A round and tasty raspberry cheesecake was put in front or me, but everything in the room disappeared when I was presented with what is now, one of my favorite desserts I’ve had in recent memory. Hand rolled vanilla ice cream covered in oreo cookie crumbs with a good drizzle of caramel and fudge. Sound simple? See the look on my face? Don’t talk to me please. 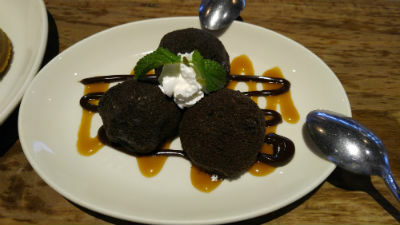 I need to be alone right now with my dessert. That’s better.